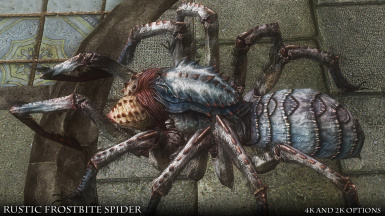 RUSTIC FROSTBITE SPIDER SSE is a high resolution retexture of the neglected Frostbite Spider, which Bethesda only made 1K textures for. 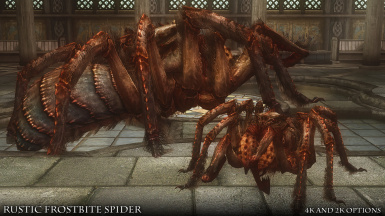 Hardly sufficient for the giant spiders in the game. Do not upload these textures to others sites - No exceptions. Do not reuse or rework these textures without my expressed permission - No exceptions. Textures.com for their excellent library of photographic resources. 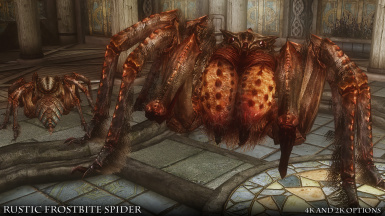 ﻿RUSTIC FROSTBITE SPIDER SSE is another in my series of rustic retextures for Skyrim Special Edition. 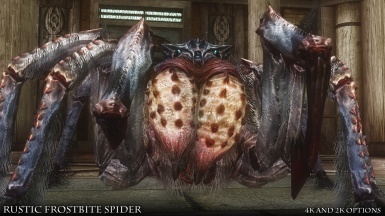 One could say that this creature was even more in need of a facelift than the Spriggans, since Bethesda never included the Frostbite Spider in its high-resolution packs of the original game. Nothing was changed with SSE, since all Bethesda did was make the hi-res packs part of the base game. 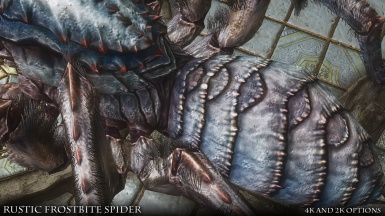 The neglected Frostbite Spider remained 1K. 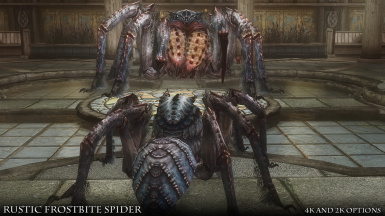 That wouldn't have been so bad for the regular sized spiders, but the giant spiders are enormous, and 1K textures just don't survive being scaled up to that size. 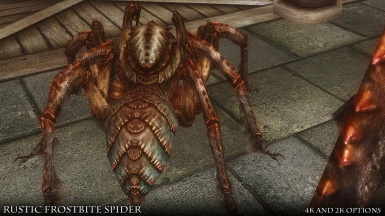 Therefore, I made true hi-res textures for this creature and packed as much detail into them as I could. 4K and 2K textures are available, so use whichever is appropriate for your setup. The normal map is saved in BC7 compression to eliminate compression artifacts. 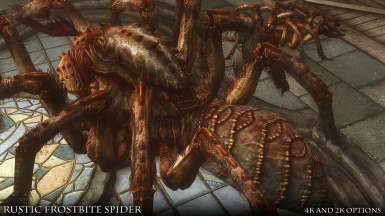 Obviously, 4K will look better on the giant spider models, but not everyone can handle that VRAM load. I hope people enjoy the revamped appearance of this wee beastie. Happy hunting.